It seems to me that no matter where we are living in the world at this time, we are being bombarded with psychological scare tactics, trauma, chaos, and upheaval. Information on a global level is at our fingertips. 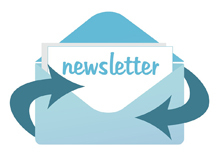 Social media demands instant responses and the pace of life is ever and ever faster. While we are reacting to this sensory overload, we are distracted from what is happening right under our noses—our rights are being stripped away; our environment is being polluted; the use of excessive money is manipulating political outcomes. People are spinning, off-center and disillusioned. Yes, these times have been predicted, but it is another story to be living in them! Yet the Siri Singh Sahib told us that we would be lighthouses during these times, that people would look to us for hope and answers. So how do we deliver his vision of us now and in the future? We must excel with the Guru! We are so fortunate to have this path, this lifestyle and these values to carry us personally and to help uplift humanity. Time is of the essence to use the technology of Sikh Dharma that Siri Singh Sahib Bhai Sahib Harbhajan Singh Khalsa Yogi Ji bestowed on us. There are so many aspects of this technology that can uplift our spirit: Sadhana, Banis, Seva, Gurbani Kirtan, Shabd Guru, service, teaching and so much more. 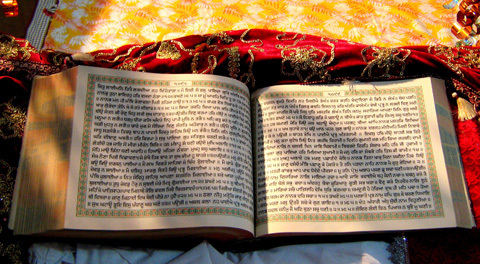 The Word of God’s Bani, and His Shabd are the best utterances. May we look to our Guru as our touchstone and excel with chanting God’s Name. SS Dr. 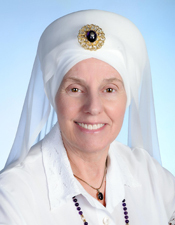 Sat Kaur Khalsa has served as Secretary of Religion since 1991 and was ordained as a Sikh Dharma Minister in 1975. As Secretary of Religion, Dr. Sat Kaur oversees and is ultimately responsible for the delivery of the functions of this Office. Dr. Sat Kaur is a long-time member of the International Khalsa Council and the Khalsa Council Executive Committee. She maintains a full-time psychotherapy private practice in Santa Monica, California and Santa Fe, New Mexico, counseling individuals, couples, and families to support their personal and spiritual growth. She is a certified Kundalini Yoga teacher, a facilitator of White Tantric Yoga®, and a published author.